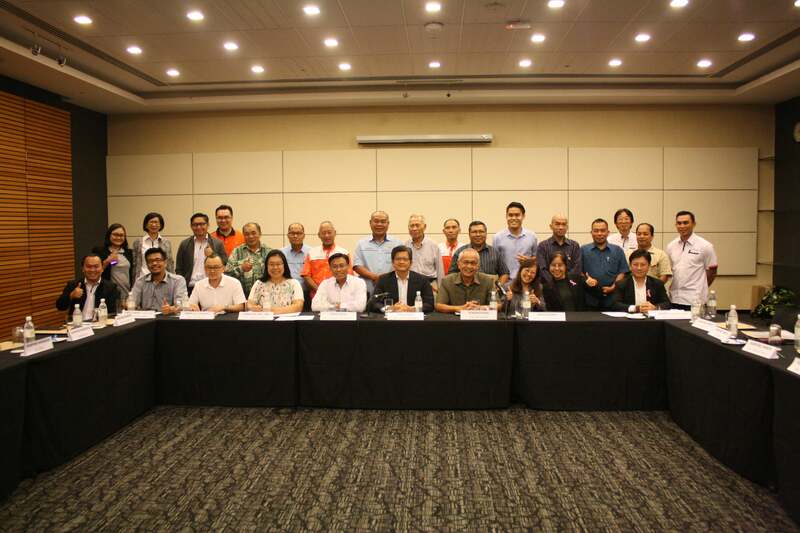 MS Group CEO-Operations, Goh Chii Bing (seated, 6th left), Temenggong Austin (seated, 4th right), CMSCI CEO, Suhadi Sulaiman (seated, 5th left) and others posing for a group photo after the dialogue session. KUCHING: Since 2014, CMS Cement Industries (CMSCI) has openly sought to engage the Mambong communities living near the company’s Integrated Cement Plant. Speaking about the annual dialogue, Goh Chii Bing, Group Chief Executive Officer – Operations, said: “A few years ago, Mambong residents voiced their concerns over dust levels that were coating their houses, cars and even laundry. They also raised concerns over the speeds at which some lorries were travelling in the area. Driven by a desire to want to help address some of those issues, CMSCI embarked on the first dialogue session in 2014 to explain to the Ketua-Ketua Kaum (KKK) and Jawantankuasa KKK members that while the operations of the factory did create some dust the levels were being monitored and were in compliance with relevant environmental regulations. In fact, CMSCI implements an online Continuous Emission Monitoring System (CEMS) with sensors installed at chimneys identified by the Department of Environment (DOE). These sensors are linked to both the control room at the plant as well as to the DOE server. This means that if dust exceeds the permissible level not only will an alarm be triggered in CMSCI, DOE would also be alerted. As for the community’s concern about speeding vehicles, CMSCI was able to show them that such vehicles were not related to the operations of CMSCI, be they transporters or staff”. “CMSCI saw the opportunity to be more than just another company operating in the vicinity of a kampung. We have a chance to become a real partner to the development of the community, creating positive and lasting change,” said Mr Goh. In the years that followed, CMSCI not only became a leading employer in the community with some 60% of the workforce comprising residents within a 20 kilometer radius, but have initiated several programmes that will see long-term betterment and growth for the communities. During the latest dialogue session, KKK and JKKK members took a moment to express their thanks to CMSCI for their efforts in creating an English Reading Programme at St. Augustine’s School, which is a collaboration with Tunku Putra-HELP School for Primary 4-6 – a programme that has already seen very positive results. The residents expressed hope that the programme could be expanded to include mathematics. However, they are aware that such programme expansion would require the approval of the Ministry of Education. Additionally, they also recorded their appreciation to CMSCI for sponsoring 200 chairs to community churches. Those present at the dialogue also applauded CMSCI for their continued efforts to engage and support the community in more meaningful ways. To this note, Mr Goh reiterated that CMS is a caring and responsible corporate company, run by professional managers. CMSCI is committed to their diligence in monitoring emission levels and is ready to support the community in engaging relevant authorities on ways to improve road safety as well as other common infrastructure. This 5th annual dialogue was attended by a Bidayuh Temenggong of Kuching Division, Temenggong Austin Dimin Anak Niyon, representatives from Puncak Borneo MP, YB Willie Mongin’s office,Ketua-Ketua Kaum (KKK) and JKKK members from various villages around Mambong and members CMSCI management team. CMS-Mambong dialogue session shows true community spiritKetua- 0 out of 5 based on 0 ratings. 0 user reviews.